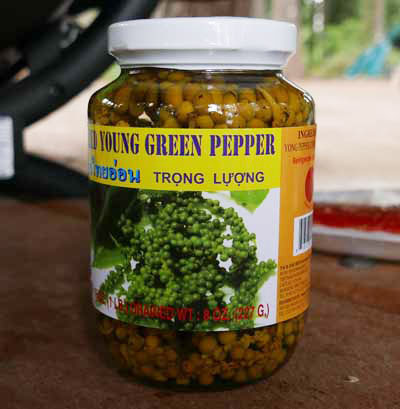 Lovely, exotic peppercorns grow in bunches on little vines 3-4" long (see photos below). The flavor is distinctively black pepper but these are 'baby' vines harvested long before maturity. Mild flavor, you can pick a few berries off the vine and pop them in your mouth along with meat and seafood. This is a great garnish for seafood, as we show in photos below, as well as steaks and lamb. We lighly seasoned a salmon steak with fish sauce, chopped shallot, garlic and black pepper. Barbecued it then served with vines of young green peppercorn. On each bite of salmon add a pepprcorn or two. We also seasoned lamb chops with fish sauce, chopped shallot, garlic and black pepper, barbecued and served in the same style. We enjoyed pan-searing a 4 oz piece of sashimi-grade tuna then served with gently fried yellow onions and black pepper, wasabi and young green peppercorn along with Fosters beer (see photo). A beautiful presentation that adds fresh taste. Also excellent with Pad Char noodles. These retain flavor very well, and the heat level is gentle not fiery and overpowering. These can be also be used to make "nam prik". Packed in a glass jar. Ingredients: young green pepper, water, salt. Product of Thailand. We also offer whole white peppercorn. Stir-Fried Fish in Red Curry, "Pad Ped Pla"
Thai Beef Salad, "Yum Neua"
Thai Fish In Chili, "Pla Rad Prik"
Unlike gai pad khing, which is cooked at smoking point, this dish is cooked at medium high - any more heat and the vegetables will be destroyed. A more appropriate name would be Gai Pad Prik Gaeng, because this uses red curry paste. As with gai pad khing this dish can also be made with pork or beef. This is a good dish for those who don't like really hot food, as it can easily be prepared with less curry paste.